Tuesday night, I visited the Alameda Theater for the first time, for a screening of John Ford’s Fort Apache. This was also my first time seeing this classic on the big screen. 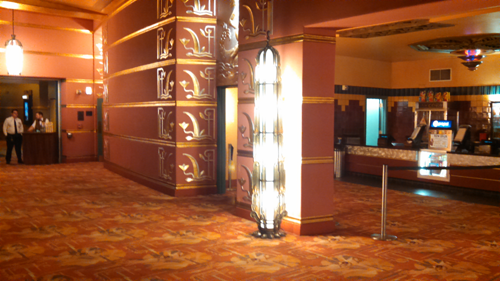 The Alameda is a huge, beautiful, art deco theater originally built in 1932. It was, of course, originally built as a single-screen theater. And although it has been turned into a multiplex, the original auditorium remains in its original size–including the balcony. I’d guess that it can sit about 1,000. There are some modern changes–the chairs are new and comfortable, with drink holders. Surround speakers line the wall (a lot of them). And, unfortunately, there’s no curtain. But the Alameda is impressive before you get to the auditorium. The lobby is huge and sumptuous. While it mostly shows new films, the Alameda has a classic movie series that runs on Tuesday and Wednesday in the main theater. I’ve been mentioning their classics in the weekly newsletter for years, but until this Tuesday I had never attended one. Before the film started, the head of the classics series, Cassady Toles–Host of the Alameda Classic Series–came out and talked about it. He mentioned other movies coming up, their Oscar party, and especially plugged Elevator to the Gallows (I’m happy to plug that one, too). He hawked the Classic Movie Passes–eight films for $44–and asked people not to pay full price. (I did, and it was only $8.) He asked trivia questions about the film before starting it. Unfortunately, Warner Brothers hasn’t made Fort Apache available on DCP, so the Alameda had to make due with a Blu-ray. (The theater has one 35mm projector, but old films generally require two.) A really good Blu-ray would have been fine, but this one suffered from mediocre transfer, with a bit of a video look. Chances are that if Warner did provide a DCP, it would be of the same transfer and with the same look. There were other technical problems. The audio was slightly out of sync for the entire film. And in the film’s last minutes, everything just stopped. After a few seconds, everything came back on again, back where we left off. But this time, the aspect ratio was off, cropping off part of the image vertically. Toles told me before the film that most of the classics are projected off DCPs. I imagine that these sorts of problems would be less likely in that situation. There was a good-sized audience. After the movie, people stuck around a bit and talked about it. 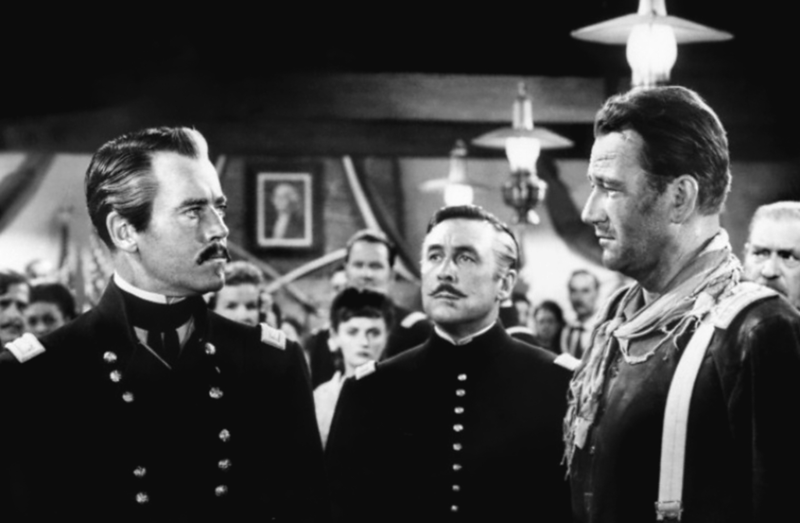 The first and best film in Ford’s accidental "Cavalry Trilogy" both romances the horse soldiers who cleared the West of its rightful inhabitants, and looks on in horror at the prejudice that made that crime possible. It’s a film about our mistreatment of Native Americans told entirely from a white perspective. Henry Fonda plays the new commanding officer at the fort–extremely strict, close-minded and bigoted. He hate the Apaches, whom he views unworthy adversaries. He doesn’t seem to like much of anyone. He won’t allow his daughter (Shirley Temple, now in her late teens) to marry a young Lieutenant (John Agar) because the Lieutenant’s father is only a sergeant. John Wayne’s Captain York is the film’s liberal voice of reason. Much of the film explores and celebrates life in the fort. It’s a full community, housing the wives and children of the soldiers, with its own rituals and celebrations. There’s warmth, love, humor, and good-natured kidding around. Fonda’s Lt. Col. Owen Thursday seems to find all of this uncomfortable. Our first encounter with the Apaches follows the worst of stereotypes. They’re murdering savages who need to be put down. Then we meet the trader who has been bilking them. York tries to explain to Thursday why the Apaches–or anyone who cared about their people–left the reservation. But Thursday is set on a military victory. His ambition and hatred of the Apaches sends him into battle. His contempt for these "breech-clothed savages" drives him, and his men, into a trap. Much as Ford clearly condemns Thursday, he can’t quite condemn the military mind. The men, with little or no respect for Thursday, follow him into what they know will be their death. And Ford celebrates this. These soldiers are wonderful, in Ford’s view, because when told to march into a death trap by a commander who won’t see what they all know, they follow orders. The ending, with Wayne’s York at a press conference, can be viewed many ways. I always think of Colin Powell at the UN, lying, hating himself for lying, but doing it anyway because he’s a soldier. It’s playing again tonight (Wednesday), in case you’re looking for a classic to watch on the big screen. It is so sad that they spent all the money to fix up the large theatre and build new ones next door and didn’t spend the extra money to have the curtains work again in the large deco theatre with color lights on them. The two large deco lamps on the floor near the candy counter need color bulbs in them not the garish white ones they have now. Blue would look great. I mentioned this to the acting manager last year and he could care less.